In this effervescent comedy, once-married Elyot and Amanda—now honeymooning with new spouses at the same hotel—reignite the old spark and impulsively elope … only to wonder a few days later whether love, jealousy or anger is the hotter passion. The Hampton Theatre Company, in conjunction with our local libraries, offers special Dinner (& Lunch) and Theater Packages, which offer wonderful events at terrific prices. 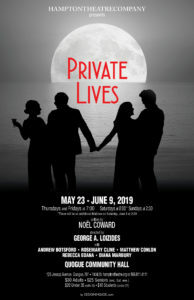 There are four packages available for PRIVATE LIVES. The Rogers Memorial Library in Southampton and the Westhampton Free Library in Westhampton Beach are offering a dinner package on Friday, June 7. Dinner is at Stone Creek Inn in East Quogue at 5 pm, followed by the show at 7 pm. The cost for dinner (including tax and tip) and show is $60. To reserve, please send your check, for $60 per person, to Hampton Theatre Company, PO Box 400, Quogue, NY 11959. Please include your name, address, phone number and email address so that we may email you your tickets. Please reference “June 7 dinner/theater event.” Reservations and payment required by May 31. The Hampton Bays Public Library is offering a dinner package on Thursday, June 6. Dinner is at 1 North Steakhouse in Hampton Bays at 5 pm, followed by the show at 7 pm. The cost for the dinner (including tax and tip) and show is $60. To register, please call the Hampton Bays Library at 631-728-6241. The Quogue Library is offering a dinner package on Thursday, May 30. Dinner is at The Quogue Club at 5 pm, followed by the show at 7 pm. The cost for dinner (including tax and tip) and show is $70. To register, please call the Quogue Library at 631-653-4224 ext. 101. The Hampton Theatre Company is offering a lunch and theater package in conjunction with the Saturday matinee on Saturday, June 8. Lunch is at The Quogue Club at the Hallock House in Quogue at 12:30 pm, followed by the show at 2:30 pm. The cost for lunch (including tax and tip) and show is $65. To reserve, please send your check, for $65 per person, to Hampton Theatre Company, PO Box 400, Quogue, NY 11959. Please include your name, address, phone number and email address so that we may email you your tickets. Please reference “June 8 lunch/theater event.” Reservations and payment required by June 1. Sunrise Highway (Route 27) to exit 64S (Rte. 104 to Quogue). Rte. 104 South (approx. 3 miles) to Montauk Highway (Rte. 80). Right onto Montauk Highway to light at Otis Ford (1 mile). Left onto Jessup Avenue. 1/2 mile to theater (on right). Montauk Highway to light at Otis Ford in Quogue. South onto Jessup Avenue. 1/2 mile to theater (on right). PARKING: There is limited street parking around the theater as well as a parking lot that can be entered just north of the Quogue Community Hall. WHEELCHAIR ACCESS: The theater is wheelchair accessible through the side entrance. If a member of your party needs wheelchair access, please come to front entrance and ask the person taking tickets to open the side door. If a member of your party requires a wheelchair in the theater, please reserve one seat at the end of a row. ASSISTED LISTENING DEVICES: The theater does not have assisted listening devices at this time.